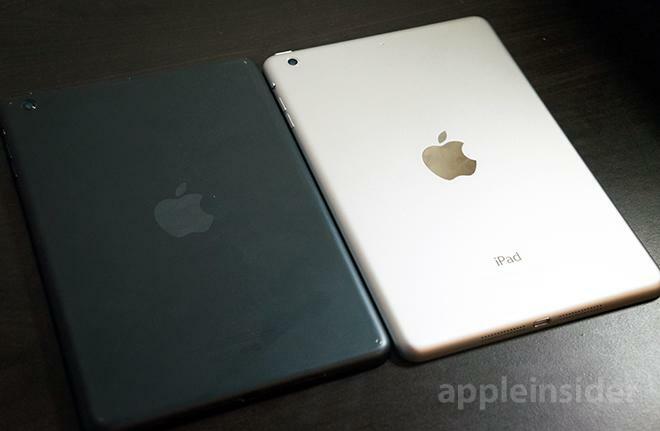 Apple surprised on Tuesday when it launched online and in-store sales of the iPad mini with Retina display, and now AppleInsider has a first look at the hotly anticipated device. 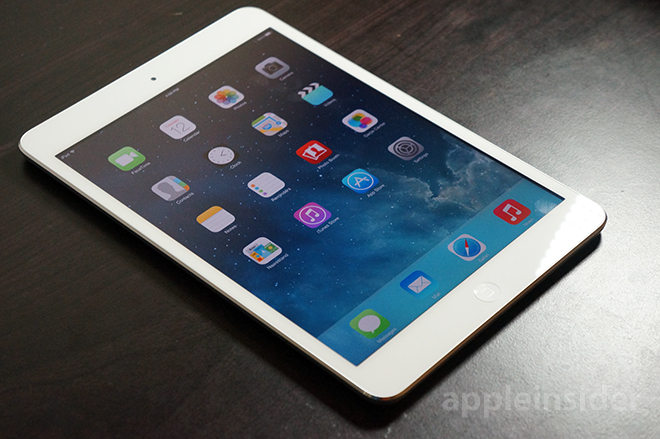 While Apple's second-generation iPad mini shares an overall design and form-factor identical to its predecessor, the inclusion of a Retina quality display requires larger battery cells to maintain reasonable operating times. 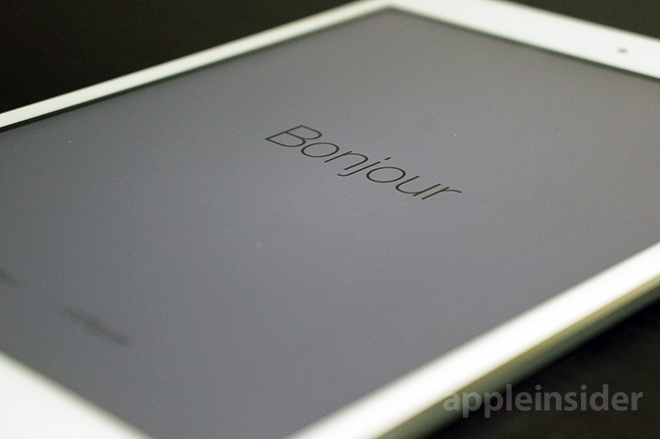 This makes the Retina iPad mini 0.01 inches (0.3 millimeters) thicker and 0.05 pounds (23 grams) heavier. The added heft is unnoticeable, however, with only a careful side-by-side inspection revealing the minute changes. 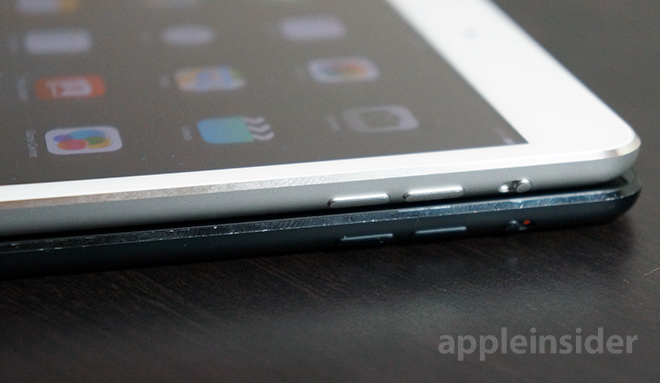 Retina iPad mini (top) is a tad thicker than the first-gen tablet. What is readily apparent, even without a comparison to the older first-generation tablet, is the screen's incredibly high resolution. For the Retina iPad mini, Apple shoehorned a 7.9-inch IPS panel with 2,048-by-1,536 pixel resolution into the thin chassis. The specification is the same as the iPad Air, but the mini's smaller display equates to a pixel density of 326 ppi, much higher than the Air's 264 ppi. 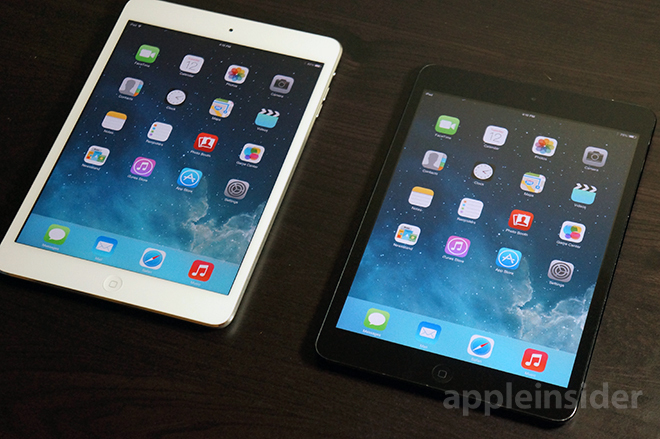 The second-gen iPad mini's Retina display (left) is noticeably sharper than last year's model. 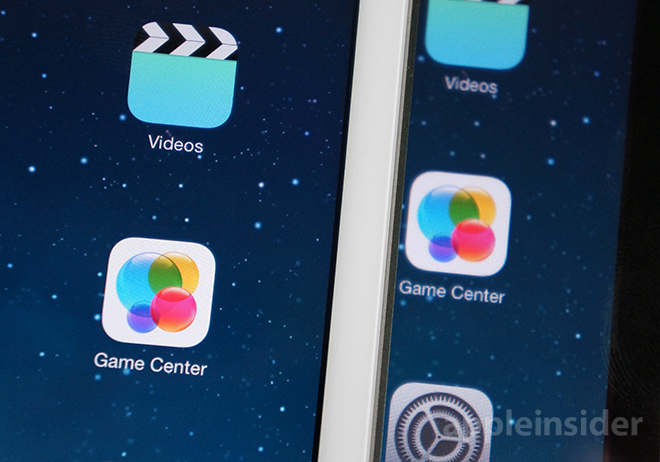 By comparison, the first-gen mini managed half as many pixels with a density of 163 ppi. As seen above, the difference is huge. For the first time ever, Apple is using the same A-series processor in the Retina mini as it does for the larger 9.7-inch tablet, as well as the substantially smaller iPhone 5s. The A7 system on a chip boasts a 64-bit architecture and has proved powerful enough to competently handle demanding tasks on the iPad Air. The new silicon's power-efficient design should yield good battery life, though a more thorough test is needed to determine the exact gains. 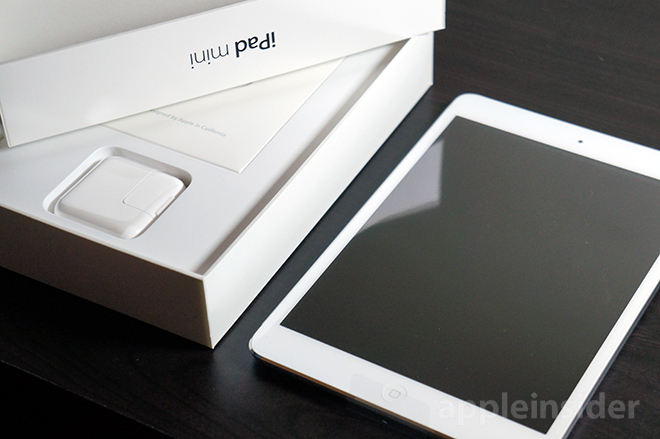 Retina iPad mini (left) compared to its predecessor. Prices for Apple's new iPad mini with Retina display start at $399 for a 16GB Wi-Fi model, $499 for 32GB, $599 for 64GB and $699 for the new 128GB option. Wi-Fi + Cellular versions start at $529 for 16GB, then move up in $100 increments, topping out at $829 for 128GB of storage. 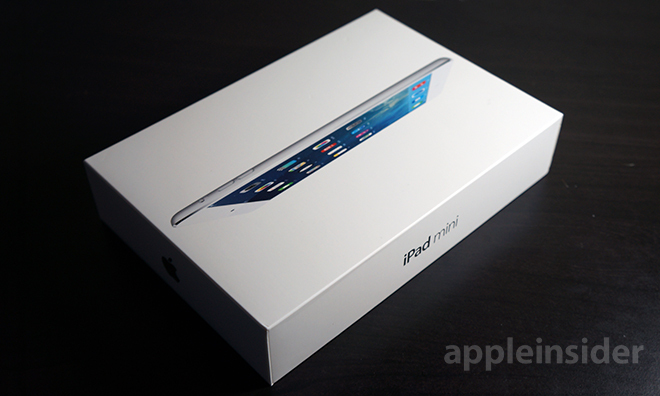 AppleInsider will be publishing a review of the new iPad mini in the coming days, but those looking to get their hands on one immediately can trade in their old iPad and iPad mini now to lock in high cash values.